2019 Suzuki GSX-R1000R BSB Replica. Picture credits - Suzuki. Submit more pictures. Straight from the showroom the limited edition GSX-R1000R BSB REPLICA comes with a host of genuine accessories to take this GSX-R to the next level. As well as the stunning Buildbase Suzuki livery the bike is fitted with: smoked double bubble windscreen, upgraded brake and clutch levers, brake and clutch lever protectors, clutch and alternator cover protectors, tank pad, fuel cap trim, clear paint protection sticker kits, front and rear axle slider sets, chain adjuster set and seat tail cover. Also included are a paddock stand, garage mat, indoor bike cover and Ogio trolley bag. Ask questions Join the 19 Suzuki GSX-R1000R BSB Replica discussion group or the general Suzuki discussion group. 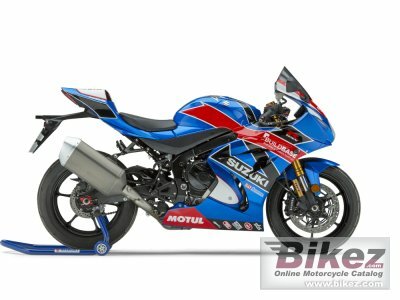 Enter your e-mail to join the 2019 Suzuki GSX-R1000R BSB Replica forum and get notification of answers and new messages about this bike. You can unsubscribe with a single click. Bikez does not display, sell	or misuse e-mail addresses. Bikez has discussion forums for every bike. View comments, questions and answers at the 2019 Suzuki GSX-R1000R BSB Replica discussion group. You can sign up for e-mail notifications when other riders answer you. If you have extensive experience with the MC, please send us a review. If you consider buying this bike, you should view the list of related motorbikes Look at photos. Compare technical specs. And check out the rating of the bike's engine performance, reliability, repair costs, etc. You can compare the rating with other bikes.